Find a Coach / Bus trip that explores Iceland. There are 29 tours to choose from, that range in length from 3 days up to 12 days. The most popular month for these tours is September, which has the most tour departures. "Doing a six day tour with a small group and small car was incredibly fun, I would..."
"Each day was a different bus and different guide, with day 3 being carried out by..."
"I’m sorry but I can’t remember how to spell the guide’s name. However, he was..."
"Hotel Cabin rooms extremely small and not very clean." "This is just the tour I was looking for. The size of the group allowed the guide..."
"It was a great trip! 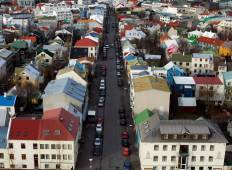 A lot activities( only sightseeing, no time was wasted) were..."
Discover the uber cool atmosphere of Reykjavik, Iceland’s capital city. Explore and swim around the famous Blue Lagoon, set against the backdrop of surreal lava fields. 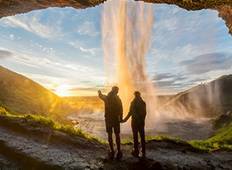 Enjoy geothermal attractions at Geysir, watch the Strokkur geyser spout, marvel at the two tiered Gulfoss Waterfall and explore the delights of the Thingvellir National Park. Travel across Iceland’s magnificent landscape comprising of roaring waterfalls, steamy geysers, icy fjords, rugged snow capped mountains, lava fields and black sand beaches. Get up close with the notorious Eyjafjallajokull Volcano, look for amazing bird cliffs and marvel at bewildering rock formations at Reynisfjara Beach. Travel along the famous Ring Road and stop to admire the beauty of the mighty Skogafoss and Seljalandsfoss waterfalls. Glide along the Jokulsarlon Lagoon packed with powdery blue and translucent icebergs. If you’re lucky, you’ll see a new iceberg rise dramatically with a crisp sounding crack. Tuck into a few slices of buttered rye loaves, freshly baked in an underground geothermal bakery at Laugarvatn. Dress in layers as the weather in Iceland can be quite unpredictable. Pack as you would for a winter holiday and include gloves, hat, warm sweaters, waterproof jacket, hiking boots, swimwear and thermal underwear. If you want to see the Northern Lights, then a guided tour is the best option, leaving the planning to the pros and allowing you to focus on taking high quality photographs. Always follow your guide’s instructions to avoid dangerous situations. Make use of stops to get off the bus and stretch your legs. Don’t be tempted to fall asleep on the coach during long journeys as you’ll miss some spectacular scenery. Pre-paid phone and calling cards are available at convenience stores or gas stations during the trip. Carry allergy or cold & flu medication in case the rapidly changing climatic conditions affect your health. Ask your guide for updates on information relating to the availability of optional excursions.